Today, we released version 1.6 of gModeller! gModeller V1.6 contains a number of bug fixes, and user interface tweaks, and we have also included Energy+ support! 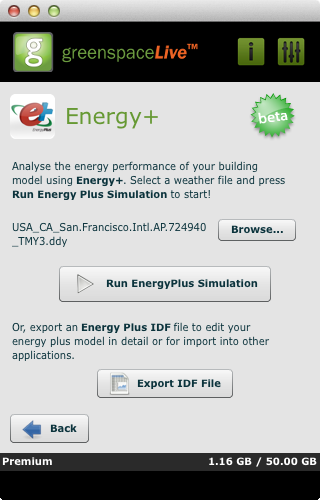 With the Energy+ extension to SketchUp you can now model your building in Google SketchUp, add building properties using gModeller and then perform an energy analysis of the model using Energy+, directly from within SketchUp. 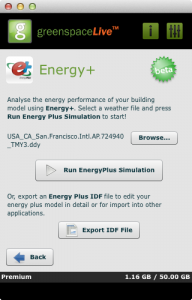 You can also export an Energy+ IDF file in order to carry out more advanced Energy+ analyses on your model, and this can be used in a number of Energy+ focused downstream tools. This is in addition to being able to export your SketchUp model as gbXML which can be used in a large variety of downstream analysis tools! The Energy+ extension to gModeller is still at a Beta level of development, and is not quite complete yet. This means that the functionality is not fully complete, and at the moment provides support for model geometry and constructions, we are still working on implementing system handling and other functionality required to carry out a full Energy+ analysis. Because the Energy+ extension is still in beta, it may contain some bugs and other small glitches when analysing models. However, we are really excited about this functionality in gModeller and thought we would share it with you. We’d love to hear your feedback and suggestions on this, and we will be updating gModeller with more fully featured Energy+ features soon. Improved Mac OS X Support – gModeller should work much better on Mac OS X. Installing on Mac OS X is now much easier and does not require your Flash Player Security settings to be modified. Improved gbXML import – importing gbXML in gModeller is now faster, and more reliable on both Windows and Mac OS X. Improved surface attribution materials – we’ve updated the building surface attribution materials in gModeller and fixed some issues with these in Mac OS X. Fixed some issues with logging in and out of gModeller. Added more constructions and materials to the Construction library section – this is important for Energy+ support! To begin using the latest versions of gModeller, you’ll need to download and install gModeller for Windows or gModeller for Mac OS X from our website. You will then be able to log into gModeller using your GreenspaceLive account and begin modelling. 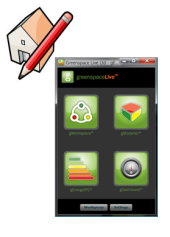 If you don’t have a GreenspaceLive account, please visit our website to register for a free trial! We hope you enjoy this latest version of gModeller and would love to hear your feedback! With all the hype being about low carbon building design these days and with an array of tools to choose from, Google SketchUp continues to grow in popularity. Gone are the outdated conceptions’ that architects manipulate primitive, simple shapes like virtual putty in 3D space, and now in, are new methods involving intelligent wall assemblies that “know” their own material make-up and that can be used to generate an information rich building model. You could be forgiven if at first glance, you perceived this as a trend towards increasing complexity, and that future architects will need to be specialists in BIM methodology in order to contribute to architectural practice. Think again. 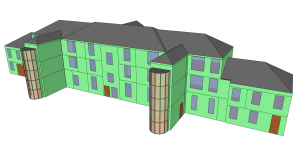 Google SketchUp, is perhaps the easiest 3D CAD based software to learn on the market at the moment and is rapidly becoming the number one choice for architects in early phases of building design. Although SketchUp does not provide the BIM functionality that is present in other far more expensive solutions, I believe the future is very promising. SketchUp has a short learning curve, competitive price (free), 3D-based focus (a prerequisite for BIM programs), pleasing visualization capabilities make SketchUp a strong contender to begin with. Now add the fact that it is part of the “Google Empire,” directly connected to Google Earth and its repository of 3D buildings, terrain, and street views—as well as the 3D Warehouse—and you have a contender with enviable if not inevitable odds for success. Of course, SketchUp does not currently possess all of the functionality of more expensive programs—far from it. 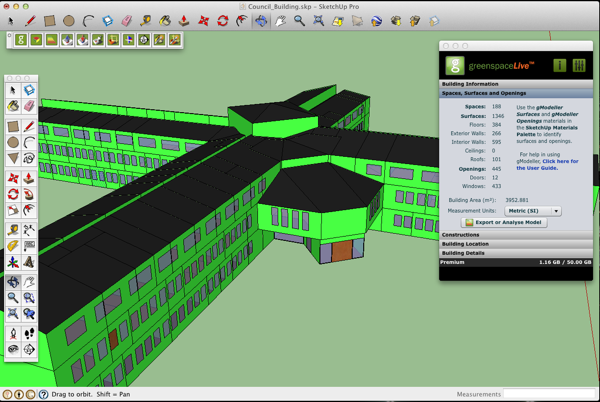 Nevertheless, now in its 8th Version, SketchUp has already become a far more sophisticated program than version 1.0. greenspaceLive plans to harness the capabilities of SketchUp, by offering gModeller an energy analysis plug-in, which allows Architects to make informed decisions on building design. JV project ECCOlab is on the move!